A smooth transition takes careful planning as well as brave decisions. Running a family estate is not a job to be taken lightly. When Birgitte Dinesen took over the family estate of Kragerup manor, it was then a massive, debt ridden farm. What she hands over to her daughter Regitze is not only 2,700 acres of productive farmland. It´s also a luxury hotel, a four-star conference centre, a wind turbine energy park and Denmark’s first treetop rope climbing adventure trail. Regitze Sophie Andersen Dinesen is learning how to become a squire. In five to eight years she shall take over her mother´s large estate Kragerup at Zealand, Denmark. Climbing to the top of towering wind turbines that will one day be her own, Regitze Sophie Andersen Dinesen can view the entire sprawling Manor she is now preparing to run. She can’t see the details, but years of hard work means she knows them intimately. The full ‘kingdom’ centres around the family manor house. Surrounding it is the luxury hotel and conference center, set in vast farmlands, 2,700 acres of food production. All this nestles in ancient woods that hosts a most un-traditional form of entertainment and income: a treetop ropeway climbing park: Kragerup Go High. Regitze is now in training to take on the job title of Squire. That´s a position that doesn’t come up often, and a career path not supported by many universities at all. None, in fact. Two years ago she made the choice to take over the estate as the 9th generation Squire. Now 26, she has another 5 - 8 years to go, to complete the training she will need for this task. The history of Kragerup goes back to 1327. The estate has belonged to the Dinesen Family since 1801, when bought by counsel Jens Kraft Dinesen. Since then the estate has been home for the family, well known for it´s officers, squires and authors. The most well-known being Baroness Karen Blixen, born Karen Dinesen. author of ‘Babettes Feast’ and ‘Out of Africa’. Karen Blixen often stayed with her cousins at the Kragerup estate, before she left Denmark for married life in Africa. Each year the estate´s current owner Birgitte Dinesen, also a lively storyteller, holds her own version of “Seven Fantastic Tales”, evenings for hundreds of guests, as she tells her rollicking adventures, the victories and near-misses of running the estate of Kragerup. Of the family´s 10 owners three have been women: Sophie Dinesen, who ran Kragerup as a widow, Ida, and now Birgitte. Birgitte started working at Kragerup in 1986 and has been the sole owner since 1998. Regitze is to take over this role. Knowing that a steady income would fund a smooth transition, Birgitte looked for ways to make this happen for her daughter, and settled on building a wind farm, completed four years ago. There are now six wind generators, rising 420 feet above the landscape, as tall as a 39 story building. Each year they produce 50 million Kilowatts to sell, as well as and providing electricity to the entire estate, and several thousand neighbouring houses in Western Zealand. 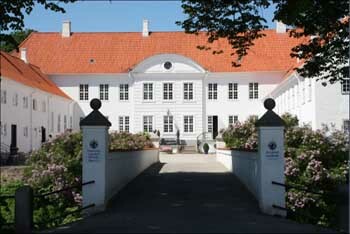 The Kragerup Manor Estate has been owned by the Dinesen Family since 1801. Three proud women of 7th, 8th, and 9th. generation, Marie Louise (middle), Birgitte (right) and Regitze Dinesen (left). 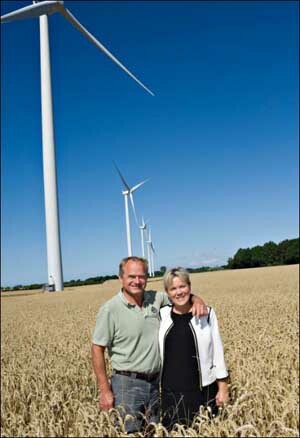 Olav Ditlevsen and Birgitte Dinesen in front of the wind turbine energy park. "Mum has been the inspirational innovator. She initiated and built the windfarm, the treetop ropeway park. She created this hotel with 50 fabulously decorated rooms, The Restaurant ‘Blixen’, the Conference Center”. The Centre is 4 Star, with luxury facilities and space for up to 350 delegates. ‘Blixen’ is an a la carte restaurant open to the public, serving innovative modern cuisine based on traditional Danish food and produce. “She renovated all the old farm buildings, finding a new purpose for everything. Mum has started so much that I have enough projects to last a lifetime. When I take over, the key word is consolidation,” Regitze Dinesen says. The estate is heated by a biofuel boiler supplied by straw from the surrounding fields and it has it´s own water supply. More than 25 houses on the estate are leased out on a permanent basis. The wheat, barley, rye, rapeseed and seed grass that are grown are sold to wholesale companies. The meat from the highland cattle are made into gourmet burgers at the Go High Treetop climbing park, the salamis are sold in the farm shop and the steaks in the Blixen Restaurant. A large production of piglets are resold. Kragerup is carbon neutral and holds the "Green Key” environment certification. Like her mother, Regitze is not afraid of good old hands-on labour. She has worked her way through most jobs at Kragerup, including dishwasher, maid, climb instructor at Go High, event coordinator and outdoor manager. She had a stint as guide for a package tour company TUI at Lanzarote and Sardinia. Before that, she was an exchange student at US Portland State University. She has a bachelor´s degree in psychology and business, and is now working on her Masters degree at night, while working as project coordinator for an event and branding agency. She speaks English, Spanish and Swedish beside her native Danish. She has volunteered for Red Cross and a tutor at Copenhagen Business School. "It is not entirely a gift to be the 8th generation owner of an estate this size. I have been raised to be proud. This approach makes me want to pass on Kragerup in a finer state than when I took over. I´m looking forward to the day when Regitze becomes the owner and I can step down. Telling tales to the guests, doing the flower decorations, that´s all the duties I want,” she says. 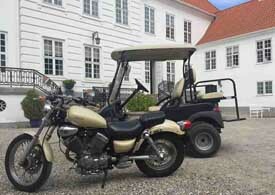 Kragerup has been completely renovated as a luxury hotel and conference center by the present owner Birgitte Dinesen. Now her daughter Regitze is to take over the entire estate. Birgitte and Regitze have always been close, but Birgitte has promised that when the time comes for the handover, she’ll move to another postcode to be well out of her daughter’s way. To secure Regitze a good start as Squire, Birgitte and herself recently established an advisory board to play the role as Regitze´s ‘backing group’. The group shall advise on strategy and the future business plan. The board consists of well known Danish non-executive directors and specialists within agriculture, leisure, conference operations, communication, events and finance. Birgitte Dinesen is quite sure that Regitze shall make full use of the broad education she has had though jobs she has taken on both in Denmark and abroad. She herself has fond memories of the years she studied and worked abroad, including a boarding school for girls in the UK, and two years each working in South Africa, America and Australia. Her father made her come home to to receive a formal education at an agriculture school in Denmark. Her years in Africa had a similar impact on her creative life as they did to her famous relative Karen Blixen. Today Birgitte is a respected and devoted painter, exhibiting at art galleries all over the country. African animals are a frequent subject of her work, many of which can be seen in the manor´s main building. "We work for the same cause, a good, healthy continuity of the Kragerup Estate. The ways we operate differ though. I have been the innovative and intuitive entrepreneur, with different ideas on the go, trying and testing things out. Regitze has a far more systematic and strategic approach. She will really need those skills, to make her contribution to Kragerup and the employees. I’m more the master and impatient soul,” Birgitte Dinesen says. There is no formal education for the job of running a manor Estate as the hereditary owner, or esquire. The usual preparation for this unusual position would be an agricultural education, alongside a Bachelor or Masters in Business or Economics. In Regitze case, she has to learn the hotel and event business as well as managing the farming operations. She is now doing an apprenticeship under her mother, Birgitte Dinesen. Birgitte holds the title of Squire, Chamberlady to HRM Queen Margrethe of Denmark, and holds a regular degree in Economics. 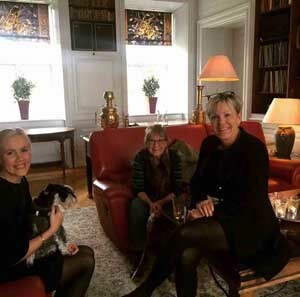 Regitze takes part in meetings on the Kragerup Manor Estate´s strategy and business plan with Birgitte Dinesen and a newly formed advisory board. Consolidation of activities within hotel, conference and event, agriculture, energy production and experience leadership. Landowner and Managing Director with responsibility for operations, marketing, economy and HR. Supported by an agriculture manager, at the time being Birgitte’s fiancee Olav Ditlevsen. Olav is to guide Regitze regarding all farming decisions. She will be responsible for 70 employees and a yearly turnover of more than £6 million.